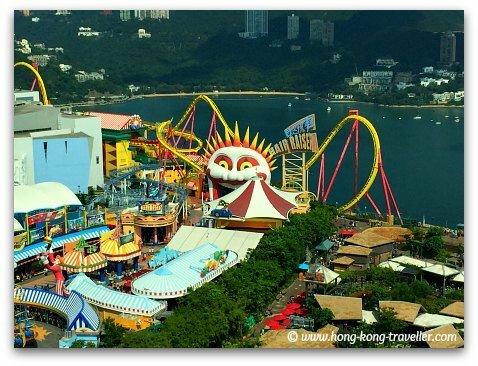 The Ocean Park Roller Coasters and numerous thrill rides are the perfect match for the array of natural and educational exhibits and the marine life shows in the park to round up the family fun. 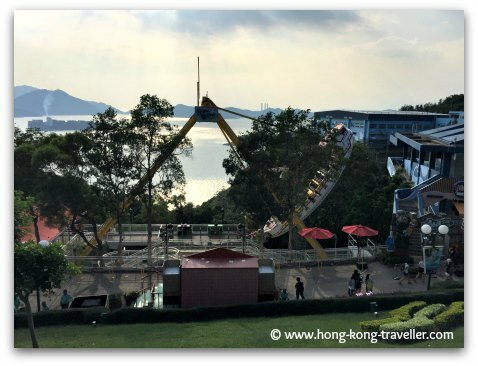 And if you have teenagers, they certainly will not let you leave without giving the rides a go, this is one of the "must do" for this age group while in Hong Kong. The rides are mostly concentrated in the Summit area of the park. 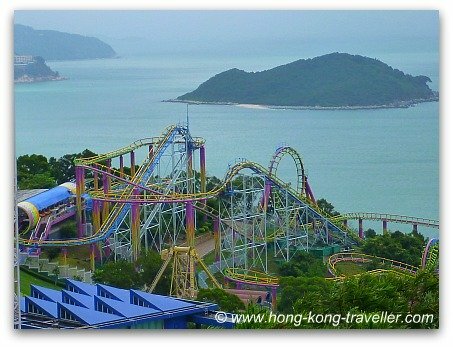 The Summit is in fact considered the "Amusement Park" of Ocean Park, this is where the larger rides and Roller Coasters are. A lot of the small children rides and playgrounds you will find in the Waterfront. The park keeps on growing and adding and revamping the old sections. 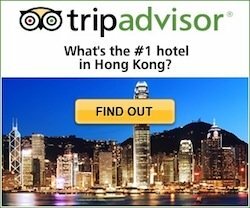 Classics like "The Dragon" and "The Abyss" are being joined by several newcomers. 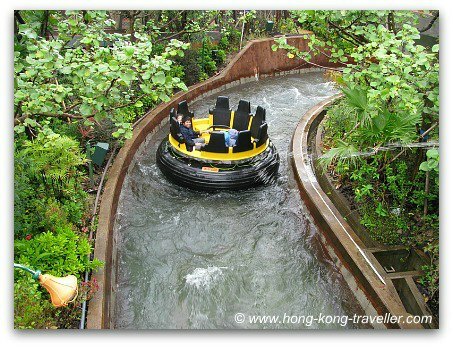 The Rainforest, has quickly become one of the park's favorite sections which contains the popular water ride "the Rapids". 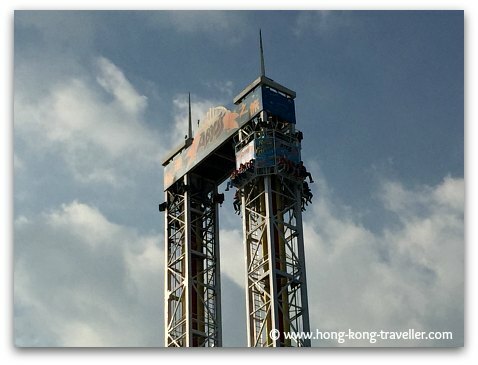 And the park's newest section Thrill Mountain features Hong Kong's fastest and bottomless! roller coaster. The latest thrill we find in Arctic Blast at Polar Adventure. 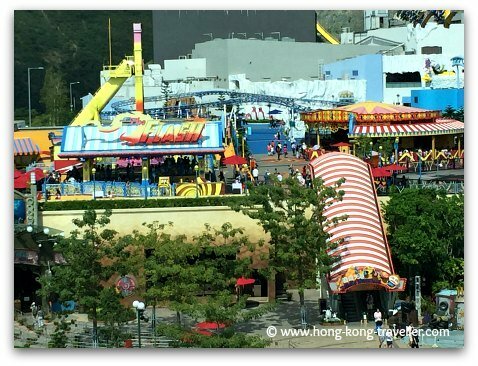 As with all popular rides, waiting time in line can be long at most of these, from 40 minutes to one hour, specially during the busiest times in the summer and the holiday periods. For all of the high-octane rides, lockers are found near the entrances so you can secure all your valuables. Here is a table summarizing all the Ocean Park Roller Coasters and Thrill Rides, their locations and height, age, and weight requirements if any. 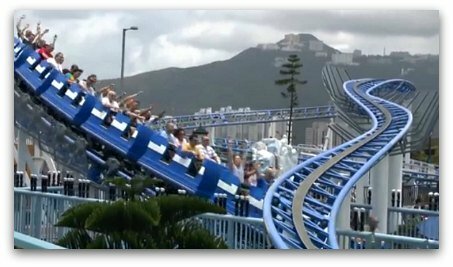 There are four Roller Coasters in Ocean Park: The Dragon and the Wild West Mine Train have been joined by Hair Raiser in one of Ocean Park's newer areas, Thrill Mountain and Arctic Blast at the Polar Adventure. 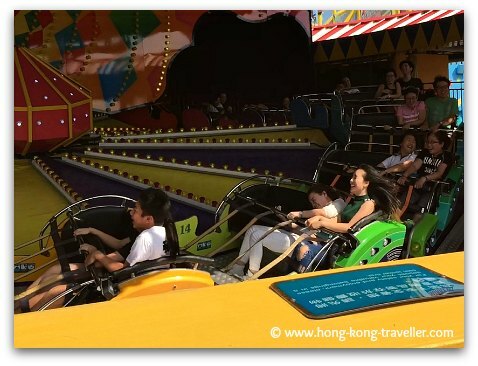 These newer areas are better equipped with lifts which make these roller coasters accesible to wheelchair-bound fans, but you must be able to stand and slide into the ride as it is not possible to remain in the wheelchair as in other rides. 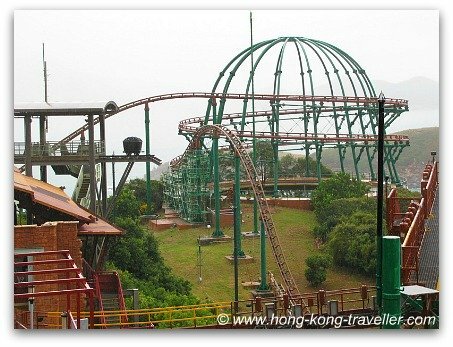 The Dragon and the Wild West Mine Train are the original roller coasters at the park, they are basically the same type of roller coaster you find at any other amusement park, but what really sets them apart is their very unique setting, high up in the Summit, overlooking some of the most amazing vistas in Hong Kong Island. 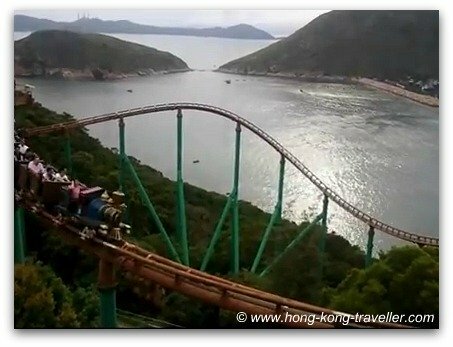 The Dragon is "the classic" of Ocean Park Roller Coasters. A favourite of youngsters, you must be 132cm or 4'4" to be allowed to ride. The Dragon is located in one of the original sections of the park, Marine World. The Mine Train is a milder roller coaster, with less twists and turns but just as fast as it rocks along this Wild West Mine. Height requirements for the Mine Train are 122cm or 4' tall. The Mine Train is located in Adventure Land. 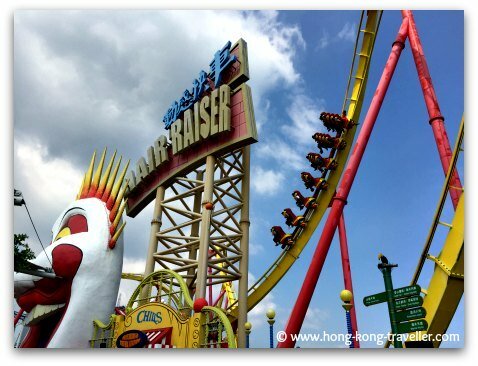 The Hair Raiser is a one-of-a-kind, not only is Hong Kong's fastest with speeds reaching 88 km per hour, it is also the only bottomless roller coaster (yes, your feet are literally dangling). Minimum height requirement for this one is 140cm or 55"
Hair Raiser is located in one of the newer sections of the park at Thrill Mountain. The Arctic Blast is also located in the Summit area at Polar Adventure. This one is a milder ride. The minimum height requirement for riders of the Arctic Blast is 100cm (39"). 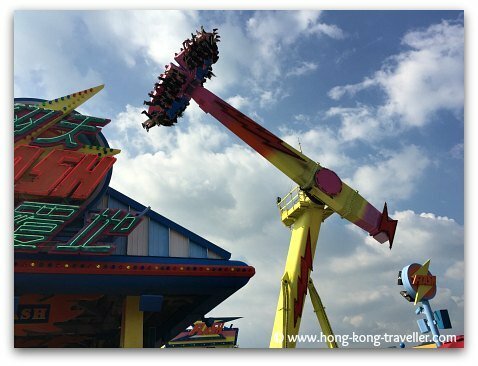 This ride is for ages 4 and above and children between 4 and 6 years old or between 100 cm (39") to 120 cm (47") must be accompanied by someone 15 or older and is at least 120 cm tall. Prepare to get wet! 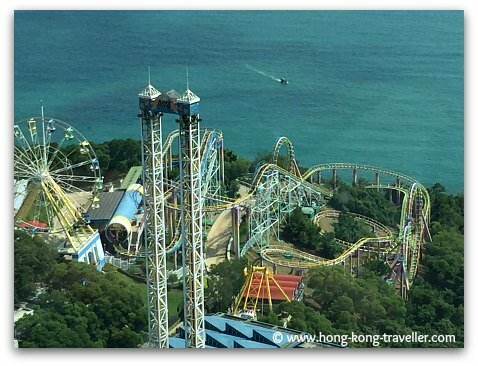 The Water Rides at Ocean Park are some of the most popular, specially during the summer when a refreshing splash is very welcome. 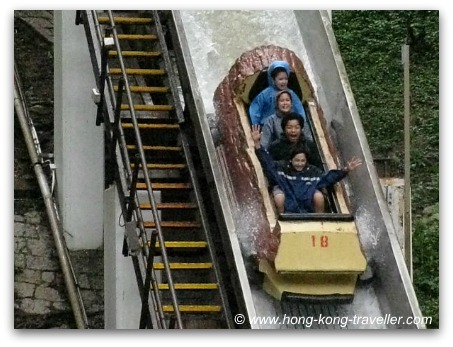 There are two main Water Rides, the Raging River and the Rapids, both in the Summit area. The Raging River together with the Wild West Mine Train are located in Adventure Land and follows the same Wild West theme where you go on the floating wooden logs. The ride is a mild one with only one big drop at the end. Ages 3 and up. Children must be 122cm or 48" tall to ride alone, but smaller children can ride with someone 15 or older or at least 122cm tall. The Rapids are located in the Rainforest, and the theme is jungle and tropical. Here you ride, twirl and slide through the river, under the waterfalls and accross the jungle in round rubber rafts. Height requirement for this fun ride is 120cm or 47", smaller children must be accompanied by an adult. 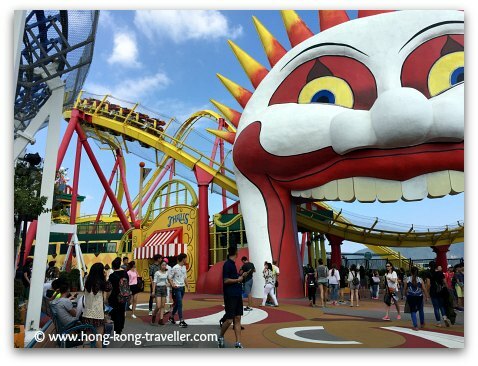 Besides the Roller Coasters and Water Rides, there are many more thrilling rides with drops, turns and dizzying twists, you can truly spend the entire day here... the kids at any rate! For ages 12 and up. This is the only thrill ride with a minimum and maximum height requirement. You must be at least 137 cm (54") and not more than 195 cm (77") tall. This is a fun one as you spin around to a lively beat. Children must be 12 years old and 130cm or 51" tall to ride alone, but smaller children can ride with someone 15 or older. There are many more rides and many more coming, this is the one park you can visit over and over again!